Masdevallias are ones of the most beautiful and tender orchids. Besides Dracula orchids, Masdevallias are the most famous of all Pleurothallids tribe and the biggest genus in this tribe. 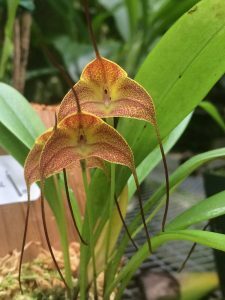 Whereas they are quite similar, Draculas are more gothic-looking, Masdevallia orchids are bright, colorful vivid plants with quite unusual flowers. They are so unusual so many do not understand that those are orchids. 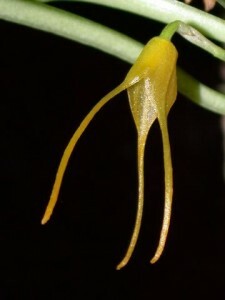 The petals, lips, and column are tiny and insignificant, whereas sepals are big, bright and showy, so Masdevallia flowers are bell-shaped. The sepals are often accompanied with whip-shaped appendages on sepal apex, so some species have bizarre and alien-looking flowers as if it is a flower from sci-fi novel about Venus jungles. In nature, these spectacular orchids grow on trees and stones in rainforests and cloud forests in shade of trees and other plants. Masdevallia orchids are sympodials without pseudobulbs or other water-storage organs with creeping rhizomes and ovate leaves. The flowers are triangular in shape with profound and bright sepals and tiny and insignificant petals and lips, sepals are often fused into a tube. They predominantly grow in mountains where there is no big difference between life forms, so they could grow either epiphytically, lithophytically or as terrestrials. 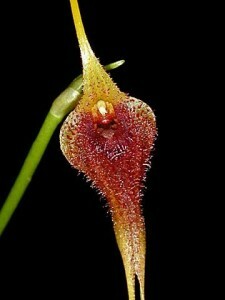 Masdevallia veitchiana is one of the most well known Masdevallias. It is called King of Masdevallias for its exceptionally beautiful large flowers. With its eight inches wide purple with orange flowers, it is called Gallo-Gallo or Roaster Orchid in Peru, this orchid motherland. Masdevallia coccinea has scarlet flowers, and there is nice alba clones with snow-white flowers, orange and yellow clones, and exquisite variety Masdevalia coccinea var porcelana with its creamy white flowers with pink striates, Masdevallia coccinea v. harryana has bright pink flowers. Masdevallia decumana is not only beautiful with purple-spotted white flowers but rather warm-temperatures friendly in cultivation. Masdevallia ignea has rather big for it size 4 inch wide fire-red flowers. Masdevallia hirtzii has lovely orange 3 inch wide flowers, and Masdevallia hercules has 2 inches wide mulberry flowers. Masdevallia davisii is called Sun Orchid for its vividly bright yellow 2 inch wide flowers, which are also fragrant. 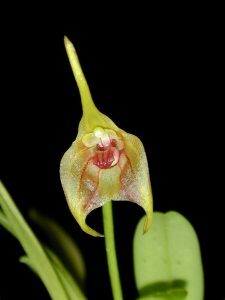 Masdevallia tovarensis is particularly difficult in growing but it has splendid 3 inches wide snow white flowers. Masdevallia nidifica with its 2 inches wide white or creamy with dark red stripes flowers is another botanical curiosity. 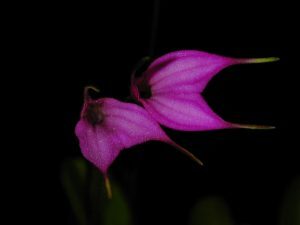 Besides large flowered Masdevallias there are also miniatures with cute flowers, for instance, Masdevallia glandulosa flowers are bright pink with amazing pimples (hence the name “glandulosa” – with glands, which lampshades this fact). Masdevallia strobelii is another miniature with beautiful flowers – they are of yellow shade with glands, resembling tiny pearls. 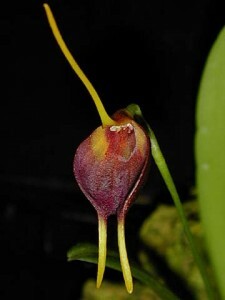 Masdevallia floribunda comes in several varieties – maroon and orange-flowered are the most beautiful ones. 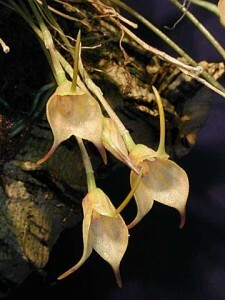 Masdevallia mendozae is rather easy in cultivation and one of the most heat-tolerant species, besides that it has very unusual flowers – golden yellow tubes. Masdevallia colossus is not colossal in any meaning – it is miniature with cute 2 inch wide fragrant flowers. Besides species, there are a large number of hybrids with exceptionally beautiful flowers – for instance, Masdevallia Tiger Bay has exotic yellow with red stripes flowers, the name of Masdevallia Peach Allure speaks for itself – it has beautiful flowers of peachy orange shade. Masdevallia Fire Queen has extremely large bright flowers, Masdevallia Fantasy Fandango has salmon-colored nice large flowers. Masdevallia Heathii is a primary cross between Masdevallia ignea and Masdevallia veitchiana, and it inherited beauty of both species. Masdevallia Marguerite has lovely orange with red flowers. Masdevallia Falcata ‘Golden Gate’ is an exceptionally beautiful cross between Masdevallia coccinea and Masdevallia veitchiana and it has canary yellow flowers. Masdevallia Southern Sun produces tangerine lovely flowers, Masdevallia Angel Tears is another beautiful hybrid. 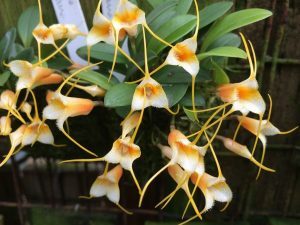 Masdevallia orchid care is not so difficult as that for Dracula ones, but we should say that Masdevallia orchids are definitely not orchids for a beginner. They have rather low light requirements – filtered light without direct sun and semi-shade is OK for Masdevallias, they need the same light levels as for Phalaenopsis and Paphiopedilums orchids. 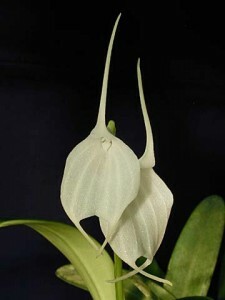 What’s about preferred temperatures – it is one of the main difficulties in Masdevallia growing because many species grow in mountain cloud forests so they do not tolerate hot temperatures, especially at the summer, they are definitely more heat-tolerant than their close relatives – Draculas, but most species require intermediate temperatures. There are some epiphytic warm-tolerant species as Masdevallia mendozae, but kings of Masdevallias – Masdevallia veitchiana and Masdevallia coccinea are particularly cool growing, so as their hybrids. Another peculiarity about Masdevallia orchid growing is water and watering. Masdevallia is an oligotrophic orchid, and would not tolerate hard tap water, so it is best to use reverse osmosis or distilled water, fertilizers should be of a quarter or half strength. Watering is another difficulty – potting mixture should be not soggy but it also should never dry, given the fact that Masdevallia orchids are not succulents and do not have water-storage organs. If to say simple – both overwatering and dryness are deadly for these beautiful orchids. Potting mixture should contain medium bark, sphagnum, cocoa chips, but some grow Masdevallias in pure sphagnum or in sphagnum and perlite mixture. Another care tip for masdevallias is to grow them in ceramic pots – they do important things. Firstly, ceramic evaporates excessive water and the second thing is that ceramic pots cool the plant, due to a higher heat conduction of ceramics pots compared with plastic ones, so you reduce the risk of over-heating your Masdevallia.